Scroll down and click on a clip. Which ones work for you? This website includes a helpline for Australia. For other parts of the world check the "Support helplines" topic below. 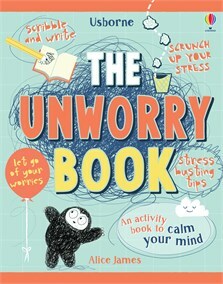 This inspiring write-in book is an unworry toolkit, full of things to calm you down and places to put your worries - and we all worry! Activities include creating a worry box, making a mood grid and mindfulness activities such as colouring, doodling and mazes. Written with the help of a psychologist, there are links to websites for tips, advice and support too. Worrying is natural and not a bad thing in itself, but extreme worry takes its toll, so this unworry toolkit is topical and valuable. [...] The presentation is colourful, informal and engaging and there are many novel ideas, with plenty for everyone to benefit from. A magic box of tricks with both write-in and mind activities that calm, reassure and relax children whose worries may be big or small. This is the perfect stress-relief book to help with ways to stop worrying. With activities, and stress-busting tips, this book will help you scrunch up your stress and let go of your worries.